The CBOX OpenLab Dashboard pulls together everything you need to configure the main parts of a CBOX OpenLab install in a single location. 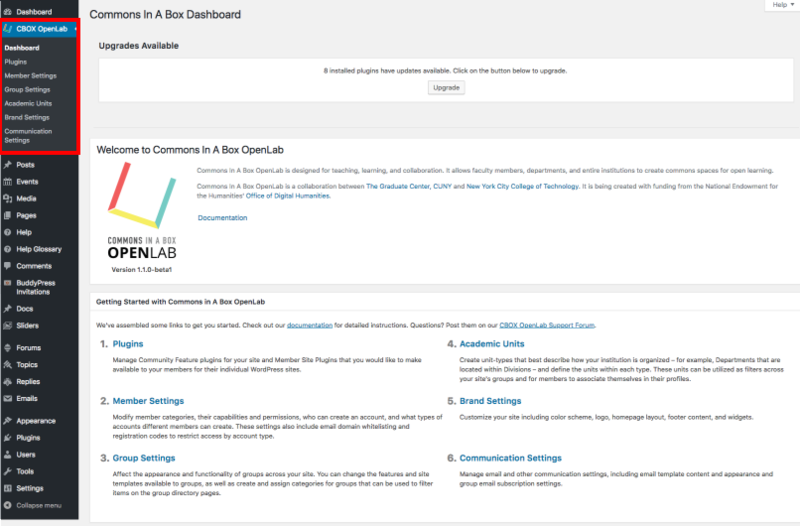 The main dashboard page includes descriptions of and links to the different sections of the CBOX OpenLab Dashboard, including Plugins, Member Settings, Group Settings, Academic Units, Brand Settings, and Communication Settings. You can find help for configuring each of these sections here in the CBOX OpenLab Guide. To get to the CBOX OpenLab Dashboard, click on the link in the left-hand menu for CBOX OpenLab.